Recently my friend and former colleague Kath has been working at the project. Since she is a qualified UK schools Inspector I asked her to do an evaluation of our work in Kinamba and I will post details at a later date. Meanwhile here is her news about the end of the second school term. My time here at the Meg Foundation is drawing to a close. Like all volunteers, I will be very sorry to say goodbye to the children, and to the staff who have become my friends and colleagues over the past two months. However, I intend to be back in 2014, so it is not a final farewell. Last week was the end of the second term in the Rwandan academic year. We celebrated with the nursery and pre-primary children here at the Meg Foundation. The top five children in each class were asked to come and sit at the front and show the rest of us their reports. As a reward, they were given two sweets. For some this was better than getting a high mark! Afterwards, the teachers distributed reports to the rest of the class, watched by proud parents and carers. Epiphanie gave a speech, and then everyone went home. The next day it was the turn of the primary children. We set off early so we could be at Kachiyru 2 Primary School, which some of our children attend, by 8a.m. There we waited with the parents and others while the children stood in rows to sing the national anthem, Rwanda Nziza, and were then addressed by the headteacher. Finally the time came to announce the top 3 in each class. Each was awarded a prize of an exercise book and a pen. We were very proud because so many of our children were awarded prizes. They are a credit to the Meg Foundation and their success reflects their hard work, and that of the teachers here and the volunteers who have worked with them when they come for homework coaching. One of the very many good things about working here has been the number of visitors to the project we have welcomed over the last two months. 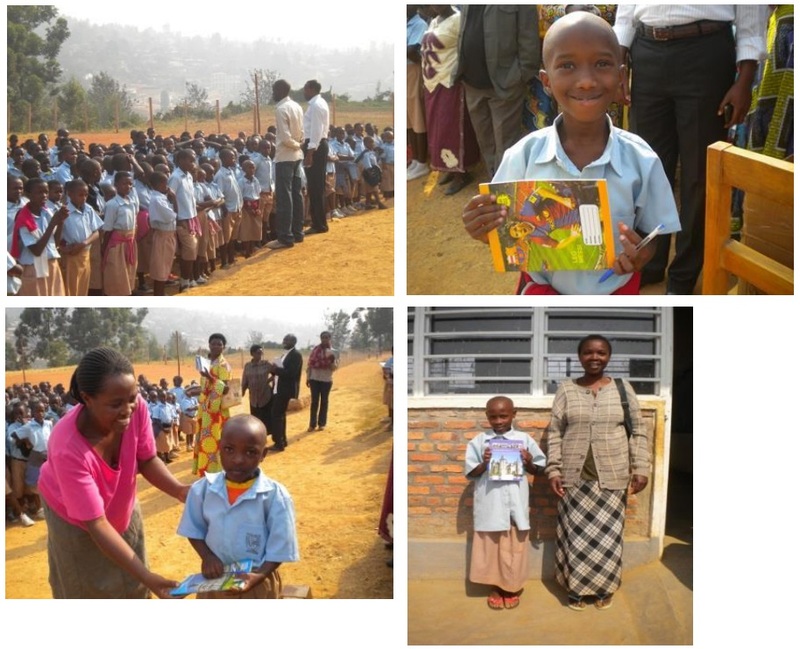 Sometimes they have read about the project in the Bradt Guide to Rwanda, sometimes they have picked up a leaflet at the Gisozi Genocide Memorial where we sell the goods made in the co-operative, and sometimes they have heard about us by word of mouth. They are always made very welcome by the staff and children, who often burst unprompted into a song of greeting. Recently we have been visited by three Swedish girls who came bearing gifts of sweets and balloons, an Englishman who brought footballs for the children, the parents of a British resident here, and a Japanese professor who walked up from the memorial on a very hot afternoon, got lost, and was eventually found and led here by a student from the Secondary School. When he had recovered from his exertions, he was very happy to do some origami with our Primary 3 children. 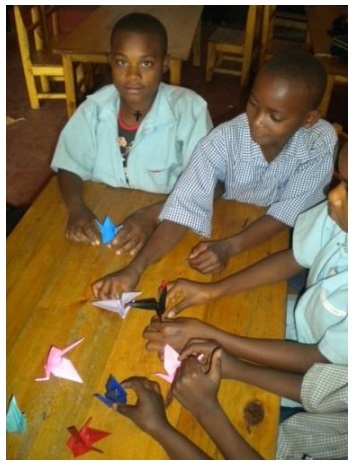 They were very pleased with their ‘peace birds’. It has been a real privilege to work at the Meg Foundation. I have thoroughly enjoyed my time here. I don’t think anyone who comes here leaves without reflecting long and hard on the inequalities of the world in which we live. I have interviewed the staff and many local people and parents for the report Meg asked me to write. 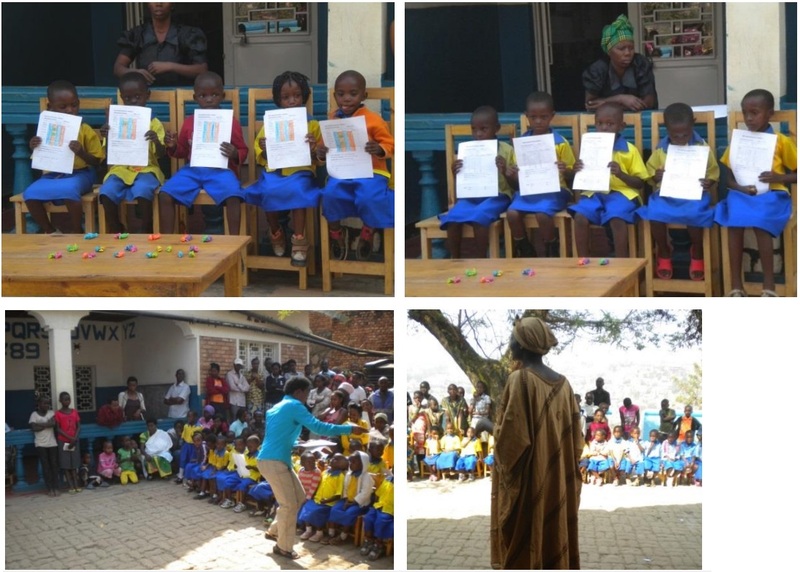 I can assure readers that the project has had, and continues to have, an impact which goes far beyond the nursery school and the provision for the primary children, and right into the heart of the Kinamba community. As one local leader said; ‘Every community should have a Meg Foundation, then everyone would benefit as we have done. No more children on the streets, no more prostitution. Everyone feeling safe’. And finally, I would like to say a personal thank you to the non-teaching staff here, who look after the children so well, and who have looked after me, and kept me in line, while I have been here. Francoise, Bea, Jeanette and Dominique.